The conference will be centred around the Sorbonne, in the heart of the Quartier Latin. The opening day will be hosted by the Théâtre de l’Odéon. On following days, the keynote lectures, seminars, panels and workshops will take place in the Sorbonne and the immediate vicinity, at the École des Mines ParisTech. Registration will be carried out between 8h and 10h30 on Monday April 21, 2014 at the Institut du Monde Anglophone (5 rue de l’École de Médecine, 75005 Paris). 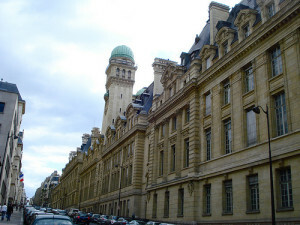 The Institut is located between the Théâtre de l’Odéon and the Sorbonne. Latecomers may register at the Institut until 16h on Monday. To register on Tuesday 22 April or any following day, please proceed to the main conference venue, the École des Mines ParisTech (60 boulevard Saint-Michel 75006 Paris) where you will be able to register every morning starting at 8h. Additional venues will be added to this page and to the Google Map below, as we confirm dates and locations for social and cultural events. Bus: 21, 27, 38, 63, 85, 86, 87. If you intend to use public transport every day, it is recommended to purchase 10 tickets at a time (a “carnet”), or a weekly pass (inquire at the ticket booths). Travelling by air or rail? Paris Charles de Gaulle (CDG). It takes 45mn to reach Paris from CDG by express train line RER B or by bus (Roissybus). The tickets cost between €7.50 and €11.50. Taxi rides to Paris cost approximately €50. Paris Orly (ORY). It takes 45mn to reach Paris from ORY by express train line RER B or by bus (Orlybus). The tickets cost between €7.50 and €11.50. Taxi rides to Paris cost approximately €50. Paris Beauvais (BVA). BVA (Ryanair flights) is 1h30 away from Paris by bus. Paris has several major train stations, notably: Gare du Nord (for Eurostar and Thalys trains), Gare de l’Est, Gare de Lyon, and Gare Montparnasse. All of these stations are connected to a Metro or RER line going directly to the conference venue.